The evening before the survey we learned that the davit was inoperable and as a result we would not be able to test the dingy. 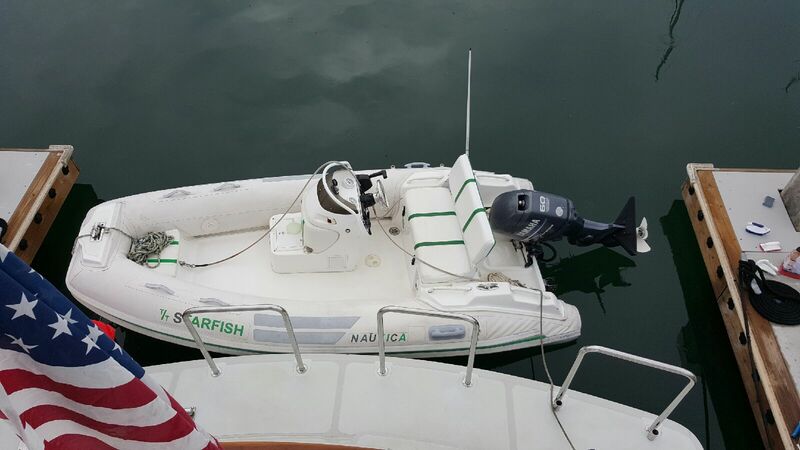 We did received a promise that the seller would fix the davit and any items we found with the dingy once we were able to fully inspect and operate it. The seller was true to his word but the path to fixing it was long, difficult and I’m sure very expensive. The initial diagnosis – bad power pack. This Davit has its own electrically powered hydraulic system, the person hired to correct the davit decided that was the problem and ordered and then installed a new pack. The pack is located in the aft end of the lazarette and not easy to get to or service. But the new power pack failed to fix the problem and the diagnosis moved to the hydraulic control block in the davit, which required that the base of the davit be removed to gain access. The block was replaced and still no joy. One new issue surfaced at this point, the new block was slightly larger than the original and the access plate on the davit, designed to keep water out of the innards of the davit no longer fit. At this point the original contractor gave up and a local hydraulics firm was engaged to fix the problem. After a review they determined that dirty hydraulic fluid had likely clogged the master cylinder and it would need to be removed. That would require a crane to take the davit off the base so that it could be fully disassembled. During that process, the real problem (or at least another major problem) showed up – the davit ring gear, used to rotate the davit around the base was locked solid. It had a grease fitting which had not been used in at least 4 years and the ring had rusted solid to the base. That likely burned out both the original power pack as well as the first replacement. The hydraulic team break the davit down and took the entire structure back to their shop. They showed up 2 weeks later, reinstalled the davit, rewired the system and it worked. . . sort of. At the boat yard, replacing the davit using the boatyards crane. This particular davit has only one control cylinder that controls both the winch portion (the part that controls the davit line in and out) and the boom control (which extends or contracts the boom). The design is a poor one – the company admits it. The design places a great deal of stress on a small silicon spacer to keep the davit line from getting tangled. That piece may have been the only part of the davit that was not replaced by the hydraulics crew, as a result the davit line had about 9 feet of loose line when it was in storage mode – not right. After a great deal of back and forth with the local crew, the selling broker and a few owners on the Nordhavn owners list we talked to the manufacturer in Canada who confirmed how the davit was supposed to work. They shipped us a couple of the spacers with instructions on how to replace them and a new cover designed to fit over the slightly larger control block. Our engineer installed the new spacer, painted and installed the new cover and now it works as designed. Davit stowed after it’s first successful operational trial – Hurray! The Dingy? After a new battery was installed the outboard fired right up and the dingy, after a through cleaning from the crew works and looks great. It just needs a new name. Thanks, glad you like the site. The wordpress theme is Avada. The colors and fonts decision was made by the gentleman who did our original branding work a few years ago, it’s held up well. To update the site with the boat information we found a local web designer here in NC, we think he did a great job too.